In this American version of a spaghetti Western, Clint Eastwood plays an innocent rancher who is about to be hung by the angry lynch mob who mistook him for a rustler and killer. Saved at the last moment by a passing marshal (Ben Johnson), Eastwood is taken before a notorious 'hanging judge' (Pat Hingle). The judge deputizes Eastwood, provided that Eastwood arrest his tormenters and bring them back for trial. Eastwood is not to be bound by such rules. 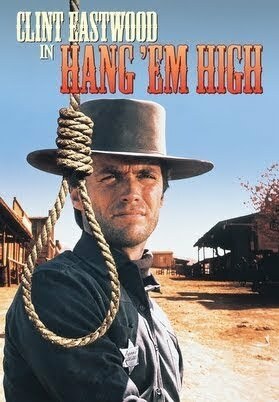 He seeks out the men who tried to hang him and kills them, one by one, except their leader (Ed Begley), who catches Eastwood offguard and shoots him. Recovered, Eastwood follows Begley to his ranch. There he will find Begley surrounded by henchmen and gunfighters. As for Begley, a dark, ironic fate awaits him... Also in cast are Bruce Dern and Dennis Hopper.